The world is split right down the middle. No, not literally. Figuratively. Forget good and evil. The true divide boils down to one, important question: are you a morning person? You know what I’m talking about. Are you a night owl, or do you pop out of bed before the sun, leading the birds into a song like a conductor? Do you view ‘having a lie-in,’ as my lovely British friends call it, as a luxury to be savored on the weekends? Or do you turn up your nose at the thought of sleeping until 10, shocked that anyone would dare miss the sunrise, let alone their 5 am jog? I, myself, used to be firmly planted in Camp Morning Person. Throughout high school, I awoke at 6:03 every morning, giving me an hour and fifteen minutes to putz about my room, enjoy a leisurely breakfast, and catch a snippet of the Today Show before I dashed out of the house at 7:18. They were wonderful, wonderful times. Since coming to St. Andrews, however, I find it increasingly difficult to drag myself out of my bed. The temptation of staying snuggled up in bed, swaddled in my down duvet far outweighs the daunting prospect of braving the drizzle and darkness that lingers nearly until noon for most of the year. Fortunately for me, my classes start at 11 o’clock at the earliest. Some days, I technically don’t have to roll out of bed until 1:55 to make it to my 2:00 art history lecture (I do live all of 2 minutes away from my classrooms, after all). The only problem with my new….ahem…sluggish lifestyle presents itself most ardently in a grumbling and very unhappy stomach. The day just doesn’t feel right unless I’ve started with breakfast food, but unless I have the sudden urge to forgo the snooze button and make breakfast early, I find I often go breakfast-less. Unless, that is, I have the foresight to plan ahead. A little bit of chopping, whisking, and stirring can go a long, long way. If you, like me, find it nearly impossible to move from a prostrate position, baked oatmeal will be your savior. You can prep everything the night before, leaving only the baking to do in the morning. You can escape from your cave of comfort for 5 minutes to pop it in the oven, diving deep beneath the covers for 40 minutes until you can no longer resist the sweet scent of baked oatmeal. If you’re really lucky, you may have a very kind roommate who will preheat the oven and slide this bad boy in for you before she goes. *hint*hint*. 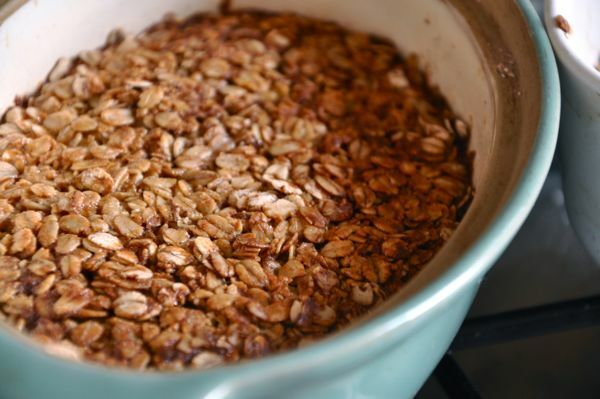 This baked oatmeal is refined sugar free. I usually make it with almond milk, so it’s also dairy free (if you don’t drizzle the butter on top). Preheat oven to 375°F. Butter an 8-inch round baking dish with a 2-quart capacity or two smaller baking dishes. In a large bowl, combine oats, baking powder, spices, and salt. In another bowl, whisk together milk, egg, maple syrup, agave, and vanilla. Arrange apple slices over bottom of baking dish, overlapping them slightly. Scatter oat mixture evenly over apples. Pour milk mixture over oats, coating thoroughly. Drizzle melted butter over top, if using. Bake for 35-40, until top is golden brown and oats have puffed slightly. If you’re feeling extra indulgent, sprinkle granulated sugar over baked oatmeal in an even layer. Turn on broiler, and put baking dish back in the oven until the sugar has melted and formed a thin crust. Eat warm. in the oven for a delicious Saturday morning breakfast. Thank you, this is delicious! I’ve been searching for a great baked omeal recipe and thanks to you, found it!